In co-producing and mixing The Prodigy’s powerfully aggressive new album, The Day Is My Enemy, Neil Mclellan not only adds another international hit to his resume, but also cements his status as master of both the vintage analog and cutting-edge digital realms. Mclellan crafted The Day Is My Enemy using, almost exclusively, UAD plug-ins, and the project is far from his first success with the band, or his first groundbreaking implementation of those digital tools. 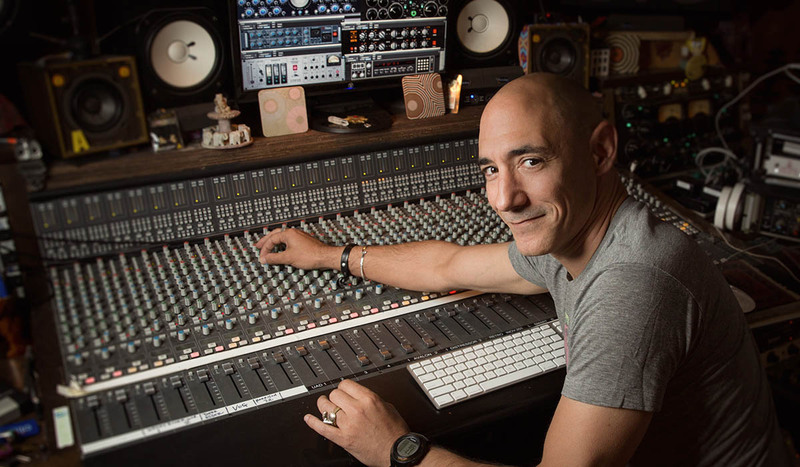 Beginning with 1995’s Music for the Jilted Generation, the New York musical polymath has helped with production, mixing, and engineering on every Prodigy album, including hits like “Firestarter” and “Breathe.” He has also worked with artists ranging from Madonna to Nine Inch Nails and, more recently, Mclellan has remixed acts and Dj's including St. Lucia, Carl Cox, Saha, and a just-completed collaboration with Phil Hartnoll and Shepard Fairey. In between records, Mclellan also co-founded and was the creative director for the New York production house, The Lodge Music and The Station, and he has produced and written music for clients like Nike and BMW. Here’s what Mclellan had to say about the UAD plug-ins behind The Prodigy and how to start your own UAD-fueled creative fires in the studio. Can describe your history with The Prodigy? I’ve worked on most of The Prodigy records. Liam Howlett [Prodigy keyboardist and composer] is my best mate. We go way back, and what happens in the studio between us is quite amazing. We have this rapport where we instantly know what the other wants. I’m able to read between the lines and get things going quickly where it might take someone else a very long time to nail a certain sound, if they get it at all. We’ve been working together for over twenty years now and, minus one or two other people, I’m the only one who’s worked with Liam on mixes and such. It’s a wonderful partnership, from a personal standpoint, and a complete privilege to work with someone of his calibre. What was your hardware setup for The Day Is My Enemy? As a modern day producer, I tend to bounce around between working at home to artist houses to programming rooms to, finally, nice big rooms at studios. The journey requires the right hardware to run around with and, since we’re in this weird place of having Thunderbolts coming on line and PCI cards still being relevant, I went ahead and bought a PCI chassis. I have three UAD-2 QUAD Core cards that I stick in there. They’re very versatile and the setup allows me to jump between Thunderbolt and non-Thunderbolt systems. It works seamlessly and has never gone wrong on me. What are some of your favorite UAD tools? On the last Prodigy album, Invaders Must Die, I used the Brainworx bx_digital V2 EQ plug-in. That’s one of my go-to plug-ins. I’m also in love with the Massenburg DesignWorks® MDWEQ5 Parametric EQ plug-in. I use it if I really want to get some rude poke on something. The UA 610 Tube Preamp & EQ Plug-In Collection is also fantastic, especially when it comes to overdriving things. The Manley® Massive Passive EQ is also very good, but very subtle. You have to really know what you’re doing, both in real life and in the plug-in version as well. The SPL Transient Designer plug-in is another one that I’m absolutely in love with. The beauty of is is that you can use it for the opposite of its intended purpose. It can “un-transient” the design, if you like, and this is an incredibly useful tool when I’ve wanted to soften some things to make certain that other sounds really punch through. It sounds like you’re pretty familiar with the original analog equipment. I come from a background of having used all of these bits of gear in real life. I’ve spent a great deal of time working in rooms with a real Fairchild to play with, and some Neve 33609s, so I’ve always had a stable of real hardware when I’m mixing. In particular, I’ve done extensive tests with the Neve 33609 / 33609SE Compressor plug-in which I use for parallel compression on all of my drums, and the UAD version is so damn close that it’s incredible. I can get a sound up wherever I’m working and, once I get into the big room with a real unit, I know that the digital version will translate well. A lot of times, I just end up sticking with the plug-in because it’s so close to sounding like the real thing, but it also gives you the versatility of not having to do a recall with physical equipment, which is super handy. Have you done any other hardware/plug-in comparisons? I’ve done extensive tests comparing the UAD-2 dbx® 160 Compressor / Limiter plug-in to three different models of 160 hardware. Again, it’s very impressive. Put an 808 kick drum across it and hear for yourself. It’s real. Are there any specific reverbs that you lean on more than others? The AMS RMX16 Digital Reverb plug-in is insane. One thing that I always test with any RMX16 emulation is how it works as a backwards reverb. Back in the days of tape, I used to use the real hardware version of the reverb, turn the tape upside down, and record reverbs backwards onto a spare track. It’s not how you normally use a reverb unit, but I was able to get that wonderful effect thanks to the RMX — you can hear that backwards reverb on the intro for “Firestarter,” for example. So I love to test emulations to see if they do the same thing and I use the UAD plug-in now for all sorts of backwards reverbs. It’s amazingly like the real unit. “The key to being the best in the studio is to understand basic balance and making a compressor musical. The rest is all about vibes.” Neil Mclellan. Do you have any favorite techniques or settings you can share? I’m a big fan of frequency-dependent compression on vocals. I like being able to tune and tweak things specifically to certain frequencies and compress just to those frequencies. The Neve® 88RS Channel Strip plug-in does that really well. That said, the Neves are not great at doing really short compression points. You hear a little click on both the real thing and the emulation, so for really short, wonderful, frequency-dependent compression, I use the SSL E Series Channel Strip plug-in and sidechain EQs to compression. I use that a lot on vocals, just to take out some of the more unpleasant nuances. That’s a favorite strategy of mine. You’ve spoken before about the Roland Dimension D and “all buttons in.” Can you talk about what that means? This isn’t in the manual for the physical Roland Dimension D but, if you push in all of the buttons that they have on the front panel — not the bypass, but all of the settings buttons — you get a wonderful effect, and that’s the one that everyone loves to use on their bass lines. If you don’t do that, you end up with a basic, overly chorused effect, but if you do “all buttons in,” it dampens the chorusing effect and something wonderful happens. It’s a very mild chorus, a bit like having a very short, 12-15 millisecond delay on each side and putting an LFO on there. It’s not like a foot pedal chorus that makes everything into a sponge. It’s much more solid and you can use it on bottom end without it clouding everything up. It also allows you to spread the sound out while still having the bass mono, right in the middle, which is the most powerful way to have bass. And the UAD emulation does the same thing? It’s amazing that it replicates the effect very accurately. I get very little phasing, which is one of the things one always has to be aware of. What advice would you give to someone who is looking to get started producing and engineering? The key to being the cream in the studio is to understand balance and how to make a compressor musical. I love to teach, and one exercise that I have youngsters, interns, and other students do, is to mix a track without touching the faders. They have to keep everything at zero and only use compression to start getting a balance together where you can feel the music, how you’re ducking some things and expanding others, things like that. Don’t worry about the fancy stuff that early on. That will come later once you’ve got your bread and butter down. So get your bedrock with balance and compression and go from there. Yes, that’s all I would concentrate on. When you find that you’ve mastered the art of musical balance, you can start bringing space into your mixes where otherwise there wasn’t any. That’s the art, knowing when an instrument needs to come forward and go back into the background and how to make your mix breathe — and that’s primarily through balance and compression. Being a great producer or mixer is not about having the fanciest equipment. Recently, I was in Russia and I saw kids who didn’t even have keyboards to make music on. Instead, they were writing everything on QWERTY keyboards with really rudimentary equipment. I was so impressed by what the music that they were coming up with, though, that it reinforced for me that your limitations, when you’re starting out, are your best friends. Those limitations are going to make you think outside the box, specifically because you don’t have the fanciest toys to work with. So how can you make great music with what you’ve got? Deal with challenges not as brick walls, but more like puzzles. There is always an answer. Limitations can bring out some amazing creativity that you didn’t know you had, so go for it!